Theater Talk: ART of WNY in news that's good and bad; and we remember Willie Judson, Jr. PARADE, the musical at American Repertory Theatre (ART of WNY), is well directed and chock full of Buffalo talent, many of whom take on multiple roles as the script demands. That's good. Unfortunately, the publishers of scripts also demand something: that presenting venues "buy the rights" to perform licensed propeties which, until a few days ago, ART had not done. 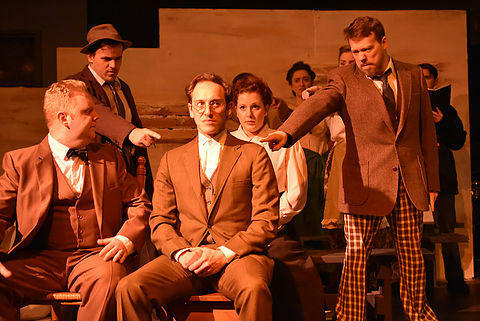 Leo Frank (Jordan Levin) is unjustly accused in PARADE, a musical about a shameful historical event in American history, at American Repertory Theatre, 545 Elmwood, through April 23. ART is not alone in this practice and still other venues have altered playwrights' original scripts without permission. If any good can come of this kerfluffle, let it be that so-called "intellectual property" be handled in a more upright manner going forward. And the Buffalo theater community, actors and audience alike, mourn the passing of Willie Judson Jr. actor, director, and mentor to many, who passed away last week at the age of only 67. 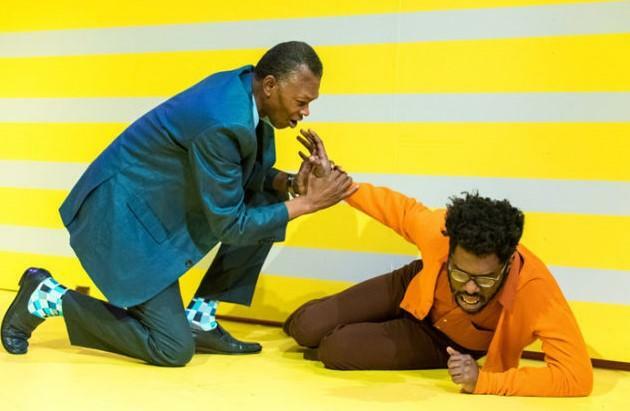 Often associated with Buffalo's two premier African-American companies, the Paul Robeson and the Ujima theatres, Judson worked at Irish Classical, ART of WNY, and recently was masterful as "Harry" in Harold Pinter's THE COLLECTION (see photo) at Torn Space Theater. He will be missed. THE SECRETARY, comedy by Kyle John Schmidt presented by The Brazen-Faced Varlets, directed by Lara D. Haberberger, starring Heather Fangsrud, Stefanie Warnick, Davida Tolbert, Jeannine Giffear, Jamie Nablo, Caroline Parzy-Sanders. Though Apr 6, Fri & Sat at 8, plus Apr 13 at 8 & Apr 14 at 2. Alleyway Theatre’s Main Street Cabaret, 672 Main St. (598-1585).